ST. PETERSBURG, Fla., March 10 — Kris Wright of Pittsburgh, Pa., is scheduled to compete in his first two formula car races ever tomorrow when he drives a John Cummiskey Racing (JCR) entry in the Cooper Tires USF2000 Championship during the Grand Prix of St. Petersburg. Saturday's twin USF2000 races on the 1.8-mile, 14-turn temporary street circuit at that Florida city are the season openers for the USF2000 series, which supports Sunday's Verizon IndyCar series season opener. 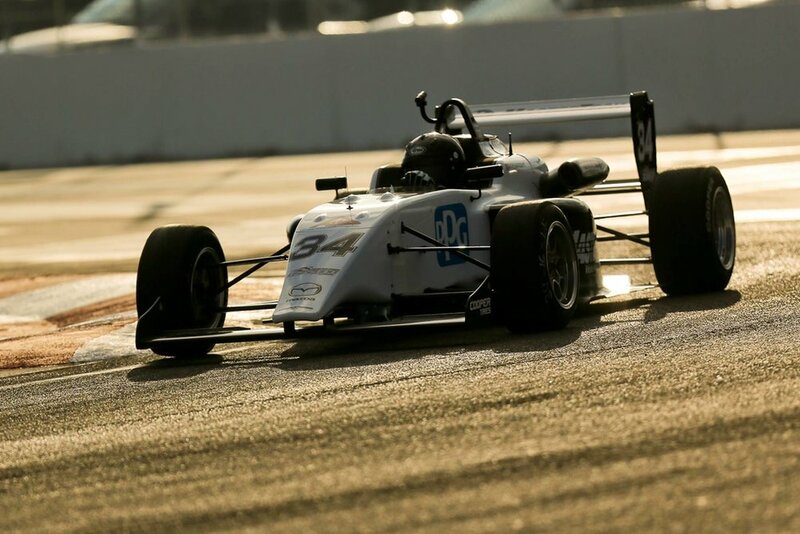 USF2000 is part of the Road to Indy development program. Wright, one of 22 USF2000 drivers, will be behind the wheel of the No. 34, which is sponsored by PPG Paints, American Financial and MasterTech. All of the USF2000 teams and drivers are getting acclimated to a brand-new car for the series, the Tatuus USF-17. JCR, which is based in Brownsburg, Ind., called upon Wright to test one of its brand-new Tatuus USF-17s at the series' test at Homestead-Miami Speedway in Homestead, Fla., Feb. 28 through March 1. The 22-year-old did not disappoint, as he finished among the top 10 on the time charts during the test. Although open-wheel cars are new to him, Wright has sports car racing experience in two very competitive series. Kris drove a Porsche Cayman in the IMSA Continental Tire SportsCar Challenge series last year, finishing 16th in points paired with Bondurant Professional driver Andy Lee. Their best finish was a 12th at another Florida track, Daytona International Speedway in Daytona Beach. Wright also competed in the Pirelli World Challenge series last year, placing eighth in the TCA championship with a Kia. That series is also in action this weekend at St. Pete, but Wright is getting his first taste of this track because the TCA division does not compete at this particular venue. The St. Petersburg street circuit is very unforgiving, as there is very little run-off room. Veteran sports car racer Nic Jönsson is helping Wright get acclimated and learn the new circuits this year, as well as developing his race craft, in his role as driver coach. "I've been impressed with Kris's willingness to learn and his ability to provide good feedback," Jönsson said. "Being able to identify what the car is doing and put into words that the engineers can understand is crucial to coming up with a good set-up. He’s already a proven athlete in golf and his hand-eye coordination skills are superb and that is serving him well in racing. Although he's young, Kris understands that racing is a team sport, and that will carry him far in this very competitive world of racing." For more information, go to USF2000.com and JohnCummiskeyRacing.com. Check out Kris’ website at KrisWrightMotorsports.com (debuting soon). Fans can also follow him on Facebook at Kris Wright Racing.